How do you know when squash is at its ripest and tastiest? Most vegetables offer a unique hint. Bananas turn a summery yellow. Peaches are soft but not too squishy. 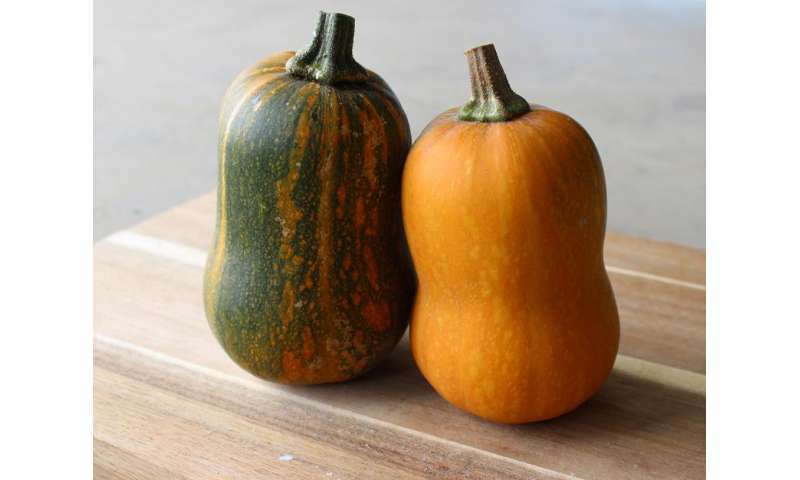 Squash, however, is an anomaly in that it shows no exterior sign of ripeness. At least it didn't until Michael Mazourek, assistant professor in plant breeding and genetics, bred one into it. All it took was a little color. With his new honeynut squash it's now possible to see where an individual squash is in its eight-week ripening process. Beginning as a bright green color, like a zucchini, and then—depending on temperature, sunlight and other factors—it turns orange in the last couple weeks, signaling it has achieved peak flavor and nutrition. The ripeness indicator he bred into the squash will allow consumers to see on the outside just when the squash is at its ripest. For the infrequent squash eater, this change may make all the difference. "We're trying to help people have healthier diets," Mazourek said. "Usually when we have people do the taste test, they say they've never had squash like this before—what's the secret? Well, it's cooked right, and it's ripe." This mini-butternut has more color, sweetness and fine texture than any butternut squash on the market, according to Mazourek. Commercially, the squash really took off last year, and now it can be found at farmer's markets and national retailers. The roots of Mazourek's squash reach back to the 1980s at the New York State Agricultural Experiment Station in Geneva, where Richard W. Robinson, professor emeritus of horticulture, crossed a buttercup and a butternut squash. Although the resulting vegetable never made it to market, this research was continued years later by Mazourek's predecessor and adviser, Molly Jahn, professor of plant breeding and plant biology, who made a dedicated push to get university-created products out to seed companies and consumers. Mazourek was able to refine this honeynut squash after soliciting feedback from growers, most significantly chef Dan Barber of Blue Hill, a leading farm-to-table restaurant in New York City, who has been a frequent collaborator. Rather than steaming squash, Barber prefers to roast it until it caramelizes. This procedure unlocked new flavors that Mazourek then sought to capture. Since joining Cornell in 2008 Mazourek has been a leading innovator in a movement to breed vegetables that appeal to the palate. The result, he said, is better tasting vegetables that encourage people to eat more nutritious food. "This really shows plants can be unique, exciting and have different flavors," Mazourek said. "There's so much variation out there in plants and food, and we're really just skimming the surface."